You know that spring has sprung in Kansas when the Redbud trees are in bloom. These attractive members of the legume family light up the hillsides and woodland edges in April with their rose-colored (rarely white) flowers. Their flowers usually precede the white flowers of the Roughleaf Dogwood and the various wild plums. In the Ozark Mountains in Missouri and Arkansas, however, Redbuds are often seen blooming the same time as the Flowering Dogwood, which makes a spectacular show. Redbuds are a popular choice for landscape purposes, so they are frequently seen in towns also. Redbuds are an understory tree. They are adapted to live under the canopy of the larger trees in a forest. They are usually less than 20 feet tall, although they can get up to 50 feet when growing in the open. Redbud flowers are edible, with a slightly nutty flavor. They can be added to pancakes or fritters or used as an attractive garnish on salads. Or you can use them to make a unique pickle relish! 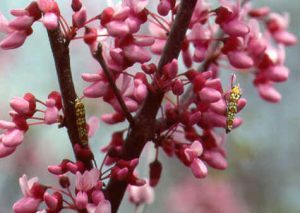 If you want to sample Redbud flowers, remember, as with the gathering of any wild edible, don’t take all that you find. Leave plenty for the tree to produce seeds, for the insects to get nectar and pollen and for people to enjoy for their beauty. When green and tender, the seed pods are also edible and can be cooked and served with butter just like peas. As they mature, the pods become brown and papery. They may persist on the branches until the following spring. Considering the abundance of seeds produced, it is interesting that only a few birds are known to make them a regular part of their diet. The leaves of the Redbud are distinctive. They grow in an alternate pattern on the twigs and are smooth, glossy and dark green. A perfect companion wildflower for Redbud turns out to be a common lawn “weed”. Henbit (Lamium amplexicaule) often covers yards in April. It blooms at the same time and the color of Henbit’s flower nearly matches that of the Redbud, making a wash of violet on the landscape. The Redbud is the Wichita Arbor Day tree for 1999. If you have a place in your home landscape for one, check with your local nursery to see about adding this beautiful spot of spring color to the neighborhood!